We take pride in our Swiss wines. Every autumn we are travelling to Switzerland to select the wines for the coming year. We taste the wines from quite a number of wine producers, but for many years now the wines of Olivier Mounir of Caves du Rhodan really stand out. And it’s not just us who think so: time after time his wines are being awarded with gold medals. On the picture you see us sampling the Pinot Noir that we will be serving in Café Bern next year. Meanwhile, Olivier Mounir proudly shows that his Fendant has just (once more) been awarded with gold. 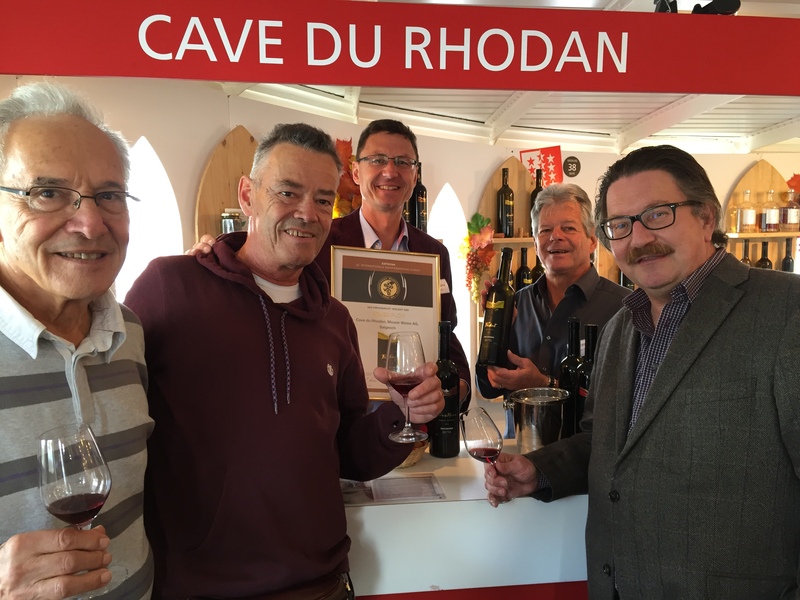 From left to right: Heinz Bachmann, great connoisseur of Swiss wines, Tom Bachmann, co-owner of Café Bern, Olivier Mounir and Thomas Maag, of Caves du Rhodan and Robert Handjes, Café Bern’s wine consultant. This is the delicious Pinot Noir that is being served in Café Bern. The wine originates from the slopes above the village of Salgesch, situated in the Rhône valley in Wallis. The vineyards of Salgesch are highly reputed for the excellence of the Pinot Noir wines that are being produced here. Pinot Noir is known to be a difficult grape to grow succesfully: it requires rather specific conditions to produce really good wines. The chalky soils of Salgesch, containing a high proportation of magnesium, the mild, sunny climate and the high altitude (580- 700 m) that provides cool nights, garantuee a long, steady ripening season. These are exactly the conditons that bring out the best in Pinot Noir: seductive aromas and great elegance. This Pinot Noir is a perfect match for the Entrecôte Café Bern, the Steak au Pistou and the Steak au Poivre, but it is also a great companion for the Emincé de Veau. The grapes for this Fendant are also grown in the vineyards of Salgesch. Fendant is the name that is localy given to the Chasselas grape. Chasselas is an ancient grape variety, that used to be cultivated on a large scale in many other wine regions, like Germany, where it is known as Gutedel, in Alsace and in the Loire valley, around the village of Pouilly-sur-Loire. In the course of time most of the Chasselas has been replaced by other grape varieties. But in Switzerland, where this variety originates according to Pierre Galet, the great expert on wine grape varieties, Chasselas turns out be extremely successful, producing attractive, subtly scented, elegant wines of excellent quality. Chasselas seems perfectly suited for the Alpine vineyards with their cool nights and it is by far the most widely planted grape variety of Switzerland. Traditionally Chasselas wines are known to be the ultimate match for cheese fondue. Just try a bottle of Caves du Rhodan Fendant with your Café Bern cheese fondue and you will understand why.